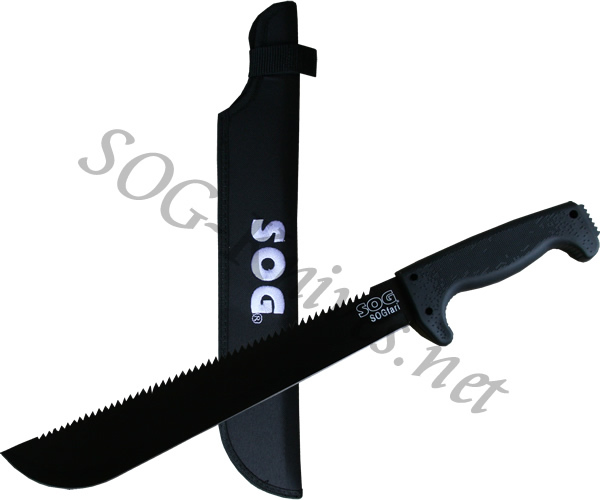 The SOG SOGfari model MC-01 has a 13 inch stainless steel blade with 50 teeth on the spine that cut deep. The edge on the blade is very sharp, unlike you will find with other machetes. The handle is made of kraton and is shaped shaped in a way that gives you increased comfort during prolonged use. The overall balance of the machete is such that the maximum cutting power is delivered with each swing of the blade. A stiff nylon sheath is included for easy carrying and to help prevent injury. Own a SOG SOGfari Machete 13" MC-01? Tell us how you like it! Got a question? Ask! Somebody will answer!